Decreasing the need for 3D glasses, increasing the viewing angle. HiSense, having already claimed the world's largest HD trophy with the 110-inch XT900, wants to do the world one more favor: riding everyone of those annoying active shutter and passive glasses. The GF60XT980 Glasses-Free 3D is just a prototype, but it accomplishes that goal with an illusion of depth that is very similar to current 3D technology out there right now. The HiSense booth at CES 2013 had a video montage of athletes running and hurling objects forward and background, demonstrating the multiple 3D layers that this UHD could pull off. The big difference is that this specially made video didn't have pop out with in-your-face 3D visuals. Instead, more of the 3D layers looked as if they receded into the background. Like a giant Nintendo 3DS, the HiSense GF60XT980 looked better when standing in front of its UHD screen from the dead center. This 60-inch television uses a high-precision lenticular lens so that the 3D can be viewed from wide angeles. Still, moving about still made its 3D a little less apparent and a little more out-of-focus. It was like a Magic Eye painting that didn't look quite right at some angles. To fix this, HiSense tucked a facial tracking system into the GF60XT980 that tweaks the sweet spot for better wide angle viewing. Sadly, with crowds buzzing about the CES show floor, this particular technology was best reserved for another day. At 60 inches, the GF60XT980's screen size can compare to most other UHD televisions that are being shown at CES 2013. However, its 2160p panel is half the resolution of a normal 2D Ultra high definition set. Losing glasses in the name of 3D loses that 4K benchmark. 2160p isn't bad. It's still double the resolution of current 1080p HDTVs out there, so the difference between the GF60XT980 and a 4K UHD set is only going to be discernible to the most critical eye. This HiSense concept model is just the latest development in the years-long quest for watching 3D television without having to put on a pair of unfashionable and comfortable 3D glasses. Quite accurately, HiSense calls glasses-free 3D "the holy grail of the television industry." The GF60XT980 makes the concept seem further along than it did two years ago thanks to UHD resolutions - everyone agreed that cutting 1080p on normal HDTVs never looked particularly good. But don't count on seeing this 60-inch prototype outside the halls of CES just yet. HiSense was quick to point out that this is just a concept model; one without a price or release date. The television industry's "holy grail" remains undiscovered. 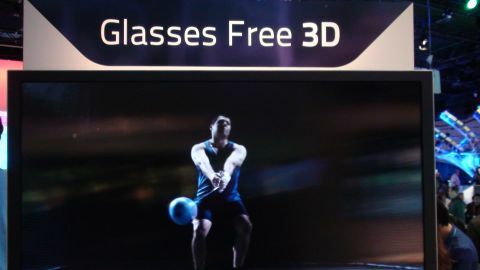 A glasses-free 3DTV that works flawlessly would make 3D a more worthwhile experience. But, as it stands, HiSense's GF60XT980 is just a prototype. No price has been set for this glasses-free UHD TV that's half the resolution of normal ultra high definition televisions.